I like my homemade Thanksgiving pies to have perfect top and bottom crusts with perfectly crimped edges. Yet, my summer fruit pies tend to be rustic and free-form and anything but fussy. No doubt my pies reflect my feelings and summer is way too fun and relaxed to worry about perfect edges on a pie! The choice of fruit also changes with the season. Although apple pie is my favorite and mandatory on my holiday table, I keep those flavors for autumn. Summer is about sweet peaches or plump berries and I let the choice of filling be dictated by whatever is ripe and fresh at the farm stands. Of course summer is also about light desserts or plain fruit and I stick to that during the week. But on weekends when we're grilling and relaxing in the garden with friends and family, I like to serve a fresh fruit pie with a scoop of ice cream on top. I'd also just as soon skip the potato salad and macaroni salad and all the other mayonnaise laden salads. Give me a well grilled steak or burger, some simple veggies and a hunk of pie for dessert. Enjoy! Combine the butter, flour, sugar, baking powder and salt in a food processor. Pulse until the mixture resembles course crumbs. Slowly pour in the ice water while pulsing just until a dough ball forms. Wrap the dough in plastic and refrigerate for at least one hour. To peel the peaches, bring a large pot of water to a boil and submerge the peaches fully for one minute. Remove with a slotted spoon and place them in ice water to cool. The peel should come off easy with your fingers. Remove the pits and slice. In a bowl, combine the sliced peaches along with the lemon juice, salt, flour and 1/4 cup of sugar. Because peaches can vary greatly in sweetness, you should taste them at this point and decide if you want to add part or all of the additional sugar. Roll out the dough approximately 3" larger than your pie pan and drape the dough into the pan. Pour in the peach filling and fold the edges of the dough into the pie. Place the pie pan on a baking sheet to catch drips and bake in a pre-heated 350 degree oven for 45 minutes or until the crust is a light golden brown. Allow to cool to room temperature before slicing. Makes approximately 8 servings. I love the look of your rustic pie. It also says delicious! Oooooh so summery and pretty!!! All of my crusts end up looking "rustic" because I stink at making them pretty. That crust looks amazing! Hope to try making this on vacation. I love it! This look so good! 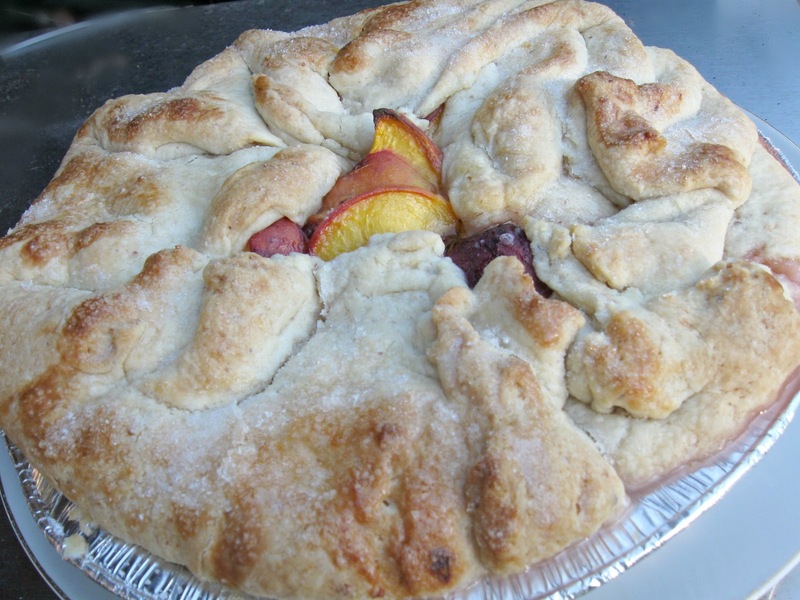 We have this peach stand so close to the house I cannot wait until they are in season here so we can make tons of things like this gorgeous pie! Happy belated birthday! I am loving the rustic nature of this peach pie--who wants to fuss and crimp pie crust in the middle of summer? The crust looks amazing! Wow! I have to say I am drooling and btw that crust could be eaten with nothing else I love it! WOWOWOWOW! I love crust like that. I could eat it with anything. I love a good crust and this has that and a great filling! YUM! Yum, Anita! So fresh and authentic looking! 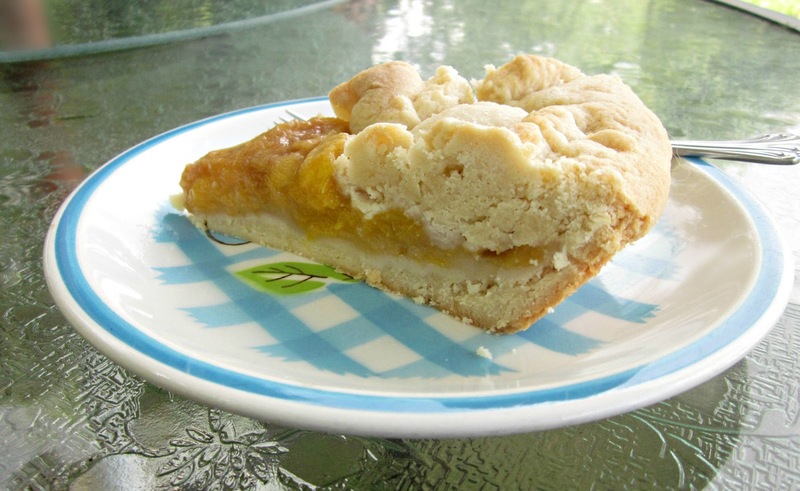 Nothing beats that real-deal summertime peach pie! I made your pie crust last night with a strawberry, peach filling. Yummy,yummy,yummy,yummy,yummy. That is the 5 yummy award. If you would like the link to the blog and pics about your crust just let me know. Oh Anita, this pie is absolutely dreamy! 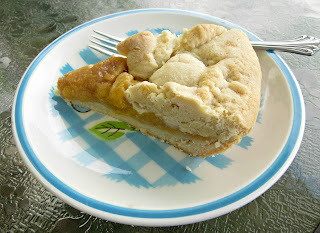 I love the rustic-ness of it, and yes, served ala mode is always the best choice for any pie!! I love this recipe for your crust... I am so making your pie for our get together on Sunday!!! Gorgeous, gorgeous, gorgeous! I am drooling over that crust. What a gorgeous pie, that reflects the carefree feelings of summer. I love the crust, and the peaches of course. Anita, your rustic peach pie is so beautiful, scrumptious, mouthwatering delicious. Love the really rustic look of the crust, and I adore peach pies...peach, anything; it really is one of my all-time favorite fruits! This pie looks absolutely delicious! Thanks for sharing! I love rustic, especially when it looks like that. Gorgeous!! Thank you for sharing at Foodie Friends Friday. Don't forget to vote on Sunday. There are prizes this weekend for the top three most voted recipes. Love peach pie and this looks wonderful. Thanks for sharing at Foodie Friends Friday. Newest follower both the blog and on facebook. I love love peach pie! Thanks for sharing! This looks really fantastic! I am seriously craving peaches this year - I had an amazing peach cobbler last week and haven't been able to stop thinking about it. 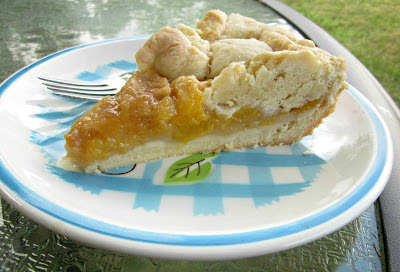 This peach pie is next on my list!